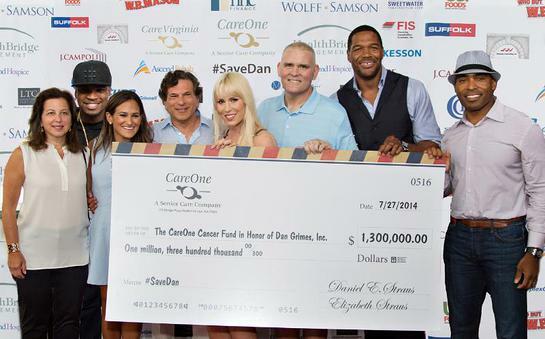 Daniel E. Straus, Founder and CEO of CareOne, announced that a fundraising campaign – launched by the company in support of long-time employee and cancer patient Dan Grimes – has raised $1.3 million. The campaign culminated in a July 27th event at Fenway Park which featured Michael Strahan, Tiki Barber, three-time NFL Pro Bowler who led the Giants to Super Bowl XXXV, GRAMMY award winning artist Ne-Yo and British-born singer-songwriter Natasha Bedingfield. The CareOne Cancer Fund In Honor Of Dan Grimes, Inc. was inspired by the 42-year-old Massachusetts native, devoted husband, father of four children under the age of 12 and CareOne/HealthBridge executive, who was recently diagnosed with Stage IV lung cancer despite having never smoked. Grants from The CareOne Cancer Fund in Honor of Dan Grimes, Inc. will provide financial support to employees like Grimes who are facing the challenges associated with a cancer diagnosis, allowing them to focus on themselves, their families and their recovery. Equally important, grants will also support essential cancer research. A series of nearly 100 events created by Grimes’ CareOne/HealthBridge colleagues generated a significant portion of money raised for the fund. Executives and team members from CareOne Centers in New Jersey and HealthBridge Management and Care Virginia Management centers across Massachusetts and Virginia came together to raise money for the campaign. At the event, Strahan, NY Giants Hall of Famer, Superbowl Champion, and the newest member of the Good Morning America team as well as co-host of LIVE With Kelly and Michael and Fox NFL Sunday, served as master of ceremonies. In addition to performances by music industry award-winners NE-YO and Natasha Bedingfield, the sold-out event featured tours of Fenway Park, food, raffles and other family-friendly activities, as well as a special appearance by Jack Edwards, play-by-play announcer and the television voice of the Boston Bruins and a longtime advocate for cancer-related causes. Numerous CareOne and HealthBridge vendors and suppliers participated in the event as well. Additionally, area Hospital and Healthcare executives attended, including Dan’s medical team from the Dana Farber Cancer Institute. In less than two years, the CareOne community has raised more than $3 million in charitable donations for various causes. In February 2014, CareOne raised more than $1 million for The Valerie Fund, an organization providing programs and services for children living with cancer and blood disorders. Earlier, in December 2013, the CareOne team provided more than 3,000 toys to Valerie Fund patients during the holiday season. Over $1 million was raised at a December 2012 CareOne Disaster Fund event to aid more than 100 CareOne employees who suffered significant losses during Hurricane Sandy. And in June 2013, HealthBridge held a fundraiser that resulted in the single largest contribution, $250,000, to the One Fund for victims of the Boston Marathon bombing. To learn more about #SaveDan or to contribute, click here.